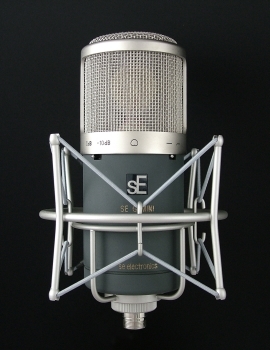 The Gemini II dual valve microphone is sE Electronics ultimate design. A no holds barred piece of microphone history. The dual valve design means pure valve warmth from the 12AX7 input valve coupled with a 12AU7 valve on the output stage in place of the traditional transformer. The result is an incredibly large detailed and intimate sound reminiscent of the classic valve microphones from decades ago, but with all of the top end you’d normally associate with the best solid state mics on the market. The all new Gemini II now has a 10dB pad and bass cut, a brand new brushed Aluminium PSU and lower s/n ratio. If you are after something that extra bit special you really must hear this microphone.